First Lady Grace Mugabe’s manoeuvres since last year’s grand entry onto the nation’s political stage seem to resemble a play from New York’s Broadway theatre. Scripted and directed by her husband, President Robert Mugabe, the play is both thrilling and chilling. A mixture of comic and tragic scenes, at least according to the letters of the ancien Roman architect and scribe, Vitrivius, are quintessential ingredients of a good play. But, at the moment, it’s hard to glimpse much in the way of tragic in this play that could well be titled; The Mugabes and Power in Zimbabwe. All that we have seen so far is Grace’s entertainment, whose percolation under the bleak world of Zanu PF politics is unrelenting. Most of the comedy is dark, and the main actor tends to score most of the laughs. The utterances draw laughter from the audience, and in an attempt to keep the audience in this state of artificial and perpetual happy suspense, Grace has on a regular basis gone off script. Indeed, at one of the rallies she seemed content to over share by telling thousands that her daughter was married a virgin. Ad litum is not only a gift, but it takes special practice. In the audience, she has some fans; every actor is bound to have fans. These are mostly Zanu PF supporters. In particular, youth groups have been seen with T-shirts and other party regalia emblazoned with Munhu wese kuna amai slogan. These admirers are pushing for Grace to take over as the leader of the party, and ultimately the nation’s president. Indeed, the recent extensive “meet-the-people” rallies around the country have been seen as part of the auditioning for the ultimate super star role; the nation’s president. However, she is also not short of those who want to see her suffer a sordid fall; in their view, the ultimate restoration of moral order for her villainous role in the play. These are mostly those who have been at the receiving end of her depredations; former vice-president Joice Mujuru and War Veterans minister Chris Mutsvangwa, who was recently kicked out of provincial structures, most likely at the instigation of Grace. After all, the First Lady had told war veterans that they are not as important as they think. 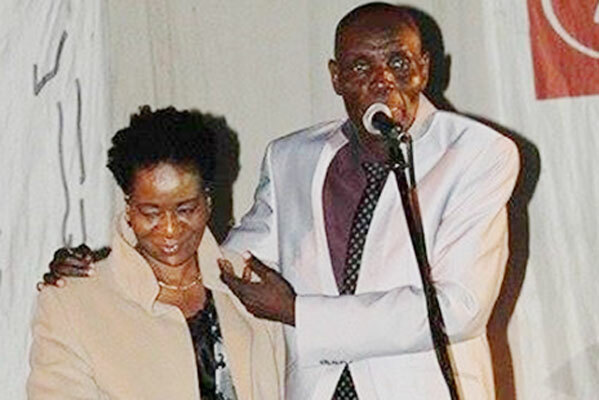 Unwisely, Grace is also beginning to ruffle the usually calm Vice-President Emmerson Mnangagwa, who is watching from the terraces as she dances provocatively to Alphonse Daudet’s L’Arlésienne. Grace’s appointment as Z anu PF Women’s League leader might be the most improbable appointment of any nature since Emperor Caligula made his horse a consul. Talentless and graceless, to date her performances have not been convincing, with most of the audience seeing them as mediocre and desperate. It appears the only charming thing about her acting is that she is married to the author of the play, who inorder to fulfil his wife’s ambitions of stardom and glamour, had to give her that all important role. Protests from the financiers of the play, bad reviews and dwindling audience attendance has not persuaded Mugabe to replace her. This is because, her role in the play is more than just acting. Gorge W Bush’s Secretary of Defence, Donald Rumsfeld, told his biographer that one of the best questions that he was ever asked was “What do you worry about when you go to bed at night?”, and his answer was that as a politician, he worries that one morning he might work up unable to imagine with precision, what could happen tomorrow or in a hundred years. In politics, imagination is an indispensable talent. Only a few politicians possess that special gift. Rumsfeld, and here at home, Education minister Jonathan Moyo and President, Robert Mugabe, are a special few. What separate these men from us are not their oratorical or organisational skills — this is bonus if one has them. But, it is their ability to see far ahead than most of us. Their special gift allows them, using information available, to detect vital signs that threaten their power and then devise, a strategy that can help them retain that power today, and in the future. Contemporary analysts seem to have come to a consensus that Mugabe might have foreseen the usefulness of the politics of land in sustaining himself and his party in power as far back as the 1980s, or even before Independence. But land might not have been his last card. Judging from what has been happening lately, he might have had another card, which those of high moral order might find repugnant; the instrumentalisation of his marriage. Moralists might struggle to fathom the idea that a husband can use his wife for a political end, in as much as a 20-year old female model can marry an 80-year-old billionaire for his riches. Let’s look at it this way. Mugabe attempts, with considerable success, to project the image of a gentleman of the first order. With his patrician mannerisms, his Savile Row tailored suits, and immense intelligence, he makes a lasting impression on those who have an encounter with him. Those around him say that he naturally gets stimulated by intelligent conversations. They say he likes to be surrounded by intelligent and well-mannered people. Naturally, this personality would have an influence on the choice of his first wife; Sally Mugabe. Renowned for a certain conversational wit, she was also gracious, educated and regal; qualities, that reportedly entranced the president. People who have watched the First Lady on television seem to agree that she lacks grace and stately behaviour expected of a president’s wife. In the politburo, she has been reported to be argumentative. The way that she throws words around at rallies has even alienated some groups, such as women. One might struggle to find anyone who agrees with the description of the current First Lady as cultured. What then could have been happening to Mugabe when he picked his second wife? He had changed? He seem not to have transformed from that gentleman of the 1970s and 1980s. Men of the president’s nature change little. Or, could it be that, what attracted Mugabe to Grace was not, therefore, so much of intelligence and grace for she possesses little, but what she could be used for; the ultimate and last political card? Why Grace, after all — to borrow from Christopher Hitchens — a preused bride who was already married when she allegedly started an affair with the President. Love? Maybe. He told Dali Tambo, a South African Talk show host that it was indeed love. But, he also told millions of Zimbabweans that he would create 2,2 millions jobs by 2018. Accustomed to brinkmanship, men such as Mugabe can reach out to some unlikely and outrageous strategies to maintain power. Gukurahundi, which he has himself admitted as his governments “moment of madness”, immediately comes to mind. Given such an eye for Machiavellian politics, it is not unreasonable to suggest that unbeknown to poor Grace, the First Lady is simply a pawn in the game to prolong Mugabe’s political life. Though Mugabe is a complex character that seem to have been designed to make fools of political analysts, one thing has been discernible from his political behaviour since the 1970s; he wants to be president for as long as he can. Today, he speaks through his wife. Nothing is illustrative of how his wife is being deployed for this specific role than the First Lady telling the nation that the then vice-president Mujuru should go, and then few months down the line she gets confined to the margins of Zimbabwean politics; the First Lady telling war veterans that they are not as important as they think, and then the next thing the War Veterans minister is suspended from the party. History’s usefulness is as a predictor of what is likely to happen in the future. We study utterances and behaviour of the First Lady, and create trends. Thus, when Grace says that she is going to ensure that her husband runs the country from a special wheel chair, or is going to move him around in a wheelbarrow, it is not just a random utterance. Though the deliverance is poor and unstatesman-like, the message contained in the utterances is clear; president, short of death or incapacitation, is not going anywhere. With limited foresight, Grace has taken this role with unbridled enthusiasm. And, what we are left with, instead of being a spouse and the nation’s First Lady, is Grace as the president’s errand girl — looking out for the interests of the old man. In short, Gracemania is not about her ambitions. Nor, is it there to offer something new to Zimbabweans, but only shore up an old status quo by keeping Mugabe’s enemies in check and fostering an unthinking subservience to the president. Unfortunately, for the First Lady, despite being a holder of a doctorate in sociology, to date, her behaviour indicates that she is what Hilary Mantel in Wolf Hall, calls a fatal non-reader. An actress in a political thriller that her husband has scripted, it seems she has no idea how her own story might end. Mugabe has an inscrutable mind, and to assume that since he is her husband, the story that he has scripted for her has a happy ending is a mistake. The nonagenarian is a patron of real politik, or a realist of the realists which makes him such a successful politician. Nothing — not even riches or fame — matters apart from power for its own sake. Staying in power eternally is the ultimate goal, even if it means putting your spouse and your posterity’s future at risk. After all, she is just a wife and disposable, and the children, as British Novelist Wilbur Smith would be put it in reference to disowning his own children; the only thing that “connects them to me is that they have got my sperm — that’s all”. Which leads us, finally, to tragedy. Grace’s increasing enemies are gathering and muttering offstage, waiting for the inevitable moment. Once Mugabe is gone, it doesn’t require much spade work to deal with Grace. A study in getting things done dirty, the man the who wants her husband’s throne, Mnangagwa, is no stranger to dark purposes. The First Lady doesn’t need to push him into desperation. Things could get messy.